What does garage door maintenance involve? One would normally think it is all about a little adjustment and lubrication work. That's part of what's involved, true, but potentially some minor repairs will also be required, and some components may even need replacing. Then there's inspection and testing, which are equally important tasks as they help you spot problems and have them dealt with before things get worse. There are two major tests that must be conducted. 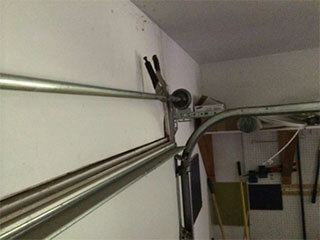 Most residential garage door systems use a torsion spring rather than a set of extension ones. There are several reasons for this, including greater durability, longer useful life and the option to regulate the tension. This is one of the most important components in the entire system because it is loaded with the force necessary to counterbalance the entire door; that is quite a lot of force. During the opening of the door, the spring unwinds and releases this force, transferring it to cables via rotating drums, which helps lift the panels up. The opener simply replaces the minor effort that you would put in to open the door manually. It's important to conduct this test every so often in order to determine whether or not the spring is overstraining, which would result in more wear and tear. The first step involves disconnecting the opener, in order to be able to lift the door manually. You now need to open it halfway and release it. If the amount of tension is optimal, the door will stay in its place or move just a little bit. If the spring tension is too high or too low, the panels won't be able to stay in the middle position. The good news is that the force can be reduced or increased fairly easily, but that doesn't mean that you should try to undertake this task yourself. Garage door springs are still very dangerous, and they should only be replaced or adjusted by professionals. Are the Safety Sensors Working? These are the small devices the electric opener uses to prevent it from closing the door on someone or something. The sensors are attached to the lower ends of the tracks, one on each side. One of the photo eyes emits an infrared beam and the other one captures it. When someone or something crosses the beam while the door is closing, the opener gets a signal to reverse its movement. All garage door openers in Connecticut manufactured after 1993 have a pair of these units. This is a safety requirement under the UL 325 regulation. The goal of this test is to find out if these devices are working properly. Ideally, it should be performed three or four times a year, at least. It is best to clean them with dry cloth and to make sure they are properly aligned beforehand. It all starts with opening the door and placing a solid object in front of one of the photo eyes. Even a roll of kitchen paper will do. The important thing is to interrupt the beam. The next step involves using the opener to close the door, either with the remote control or with the wall mounted switch. The motor should start running, but the door shouldn’t go down, not too much anyway. It can start descending, but it should almost immediately reverse. To confirm the result of this test, you can use another testing method. It involves waving an object like a rake or a broomstick in front of the sensors while the door is closing (no stationary blocking this time). Just keep your distance. The door should stop and reverse. However, if it doesn't, you need to have our experts at Garage Door Repair New Canaan check the sensors asap.